Jabra Sport Pulse vs. SMS Audio BioSport: Which of These Sports Earbuds Is Best? By now, you probably understand the importance of monitoring your heart rate while working out for getting the best results. You can monitor your hear rate by using something like a Polar monitor, which requires you to wear a strap around your chest. Or an activity band like the Fitbit Charge HR for example, which monitors your pulse through your wrist without the strap. But here’s another, and possibly an even better way to monitor your heart rate…. through your earbuds! Yes, you read that right. There’s now a number of sports earbuds that are actually able to monitor your heart rate as you work out, while listing to your favorite music! In this post, we’ll be talking about the two most popular choices: JABRA Sport Pulse and SMS Audio BioSport. Wireless Bluetooth earbuds with built-in heart rate monitor. Does NOT require a chest strap for monitoring. In-line controls allow you to control your music directly from the headphone. Built-in mic for talking calls. JABRA Sport Life application gives you feedback on your workout, monitors your hear rate, integrated exercise management and fitness tests. Compatible with most iOS and Android fitness apps. Built on Military standards: drop, shock, strength, dust, temperature and humidity tested. Playback time: up to 4.5 hours. Click here to learn more about JABRA Sport Pulse, read the customer reviews and buy it. Biometric earbuds with built-in heart rate monitor, no strap required. Self-powered earbuds with 3.5 mm gold-plated audio jack. Compatible with all major fitness apps. Has built-in mic for talking calls. Click here to learn more about SMS Audio BioSport, read the customer reviews and buy it. JABRA Sport Pulse vs. SMS Audio BioSport, What’s The Difference? The Jabra Sport Pulse is wireless. It connects to your device using Bluetooth and can be paired using NFC. BioSport is not wireless, it connects using an audio jack like the majority of other earphones. Jabra Sport Pulse gives you up to 4.5 hrs of playtime and monitoring. SMS Audio’s BioSport is self-powered, it requires no batteries or charging. Jabra’s Sport Pulse has its own application available for both iOS and Android devices. The app gives you heart rate measurements, feedback on your workout, a number of fitness tests and more. It also works with other major fitness apps like Nike+ and RunKeeper and others. BioSport does not have its own application, but it’s compatible with fitness apps as well. Jabra Sport Pulse includes 4 sets of EarGels, 3 sets of EarWings & FitClip, protective case. BioSport includes: 3 sizes of Ear Gels (S, M, L), 1 FREE month of RunKeeper Elite, a protective case. Jabra Sport Pulse is connected via Bluetooth only. While it’s true that most smart devices now have Bluetooth and using the earbuds with them shouldn’t be a problem, but if you decide to expand their use as regular earbuds for music only, say with your non-Bluetooth iPod for example, you won’t be able to do that. On the other hand, the wired SMS Audio BioSport can work with any device that has an audio jack, and the flat-design wire makes it hard to get tangled. That’s a plus. The Jabra Sport Pulse has more EarGels and EarWings included, this can potentially give you a much better fit than BioSport which only includes 3 EarGels with it. The fact that Jabra Sport Pulse needs constant recharging could be quite an inconvenience. To make use of Sport Pulse’s Dolby sound, you have to use the Jabra sound app to enable it. Jabra Sport Pulse vs. ROX, What’s The Difference? It does NOT have built-in heart rate monitor. Therefore, it does not work with any fitness app, including Jabra’s. 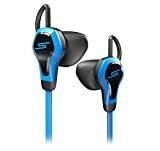 The design of the earbuds isn’t as good as Sport Pulse. As you can see, it’s an in-ear earbud but without the wings that give it a better and more secure fit. It connects via Bluetooth and can be paired using NFC. It provides up to 5.5 hrs of playback time. Naturally since it has less features, it’s able to provide better playback time than Sport Pulse. Click here to learn more about Jabra ROX, read the customer reviews and buy it.